I've fallen behind taking pictures lately. 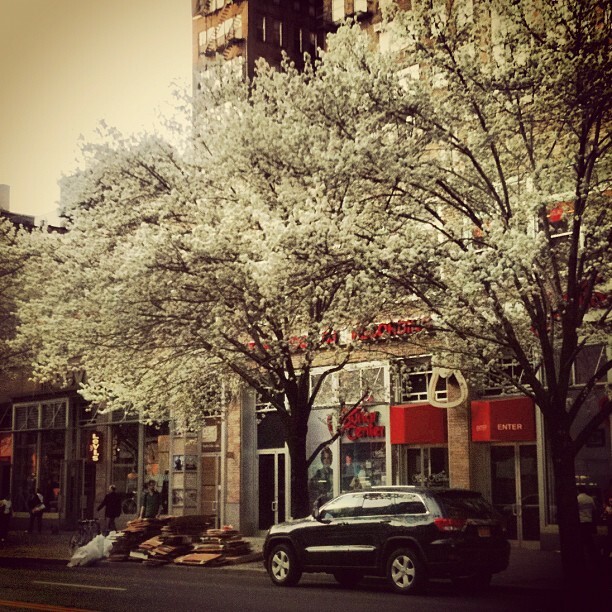 However, I have been so thrilled with all the blooming trees. Manhattan. Kurt say these are awful street trees (remind me of the name again?) 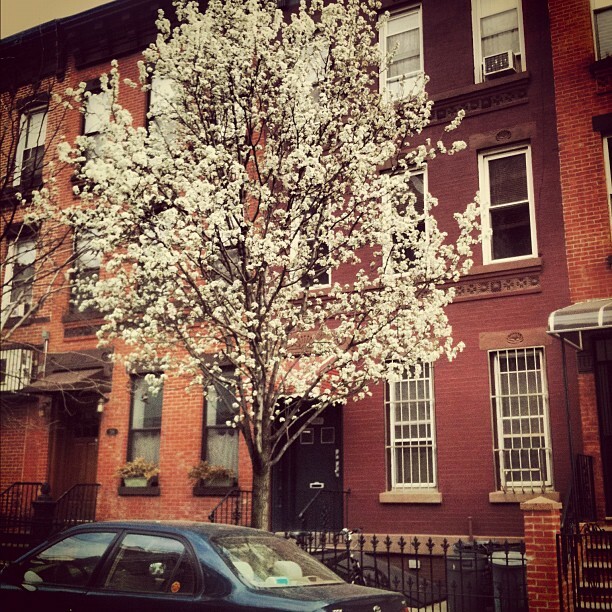 but for a brief period of time during our early spring, I've been enjoying them everywhere. Whoops. I've been taking an extended study break. It's been so nice doing nothing for a while. Plus, I have to spend time at work to study for my next test and I don't want to spend any extra time there! 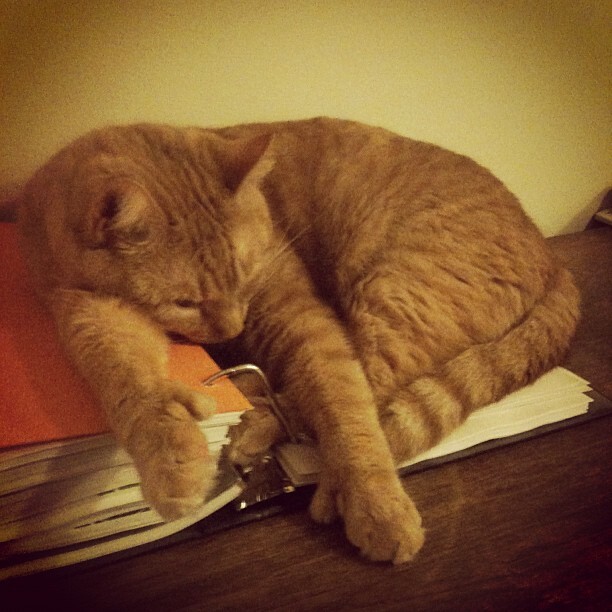 Thankfully, Aubie is keeping my study binders safe and sound. 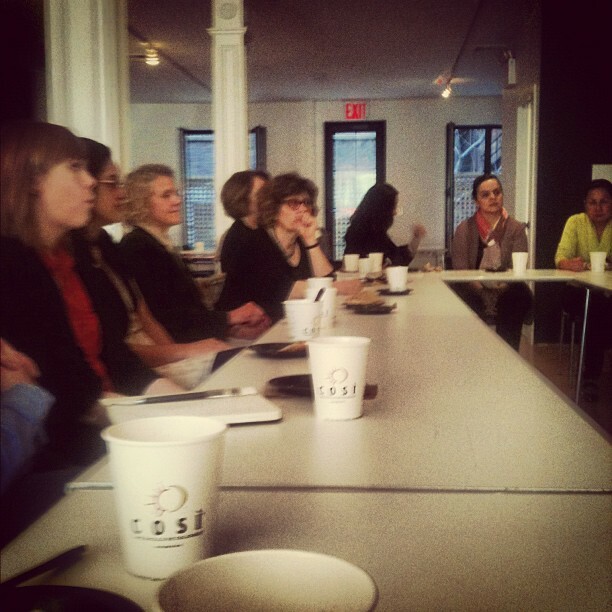 Jenn and I attended a Women in Architecture breakfast discussion at the CFA. ◊ My first Union Square lunch of the year with Kurt and Christian. Dos Toros burritos in the park on a Friday is hard to beat. ◊ Happy hour drinks with Kurt at Stella's in the South Street Seaport. I'm a sucker for cobblestones. ◊ Dance party at the Bell House with Jenn, Christian, and Hillary. ◊ I bought some shoes I didn't need. DSW has a way of sucking you in like that. ◊ First cookout of the year at Kurt's apartment followed by a couple rousing games of Catch Phrase. ◊ Unlimited mimosa brunch at The Half Pint after a particularly comical/annoying ARE prep course. ◊ Yummy handcrafted Salmon Burgers made by yours truly. Apparently I need to be more diligent about taking pictures! 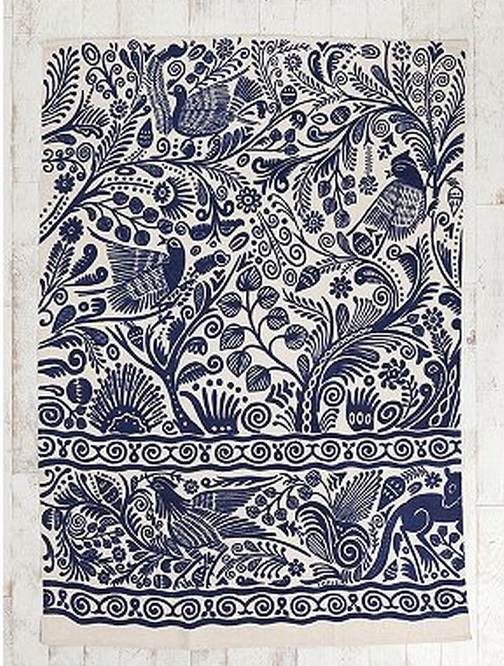 In other news, I'm on the hunt for a rug for my apartment. My hardwood floors aren't too bad but something soft under my feet wouldn't be bad. Plus, it will be nice to define my living room/sleeping area. I love this one from Urban Outfitters. It's really inexpensive but I'm worried it will have too much going on. 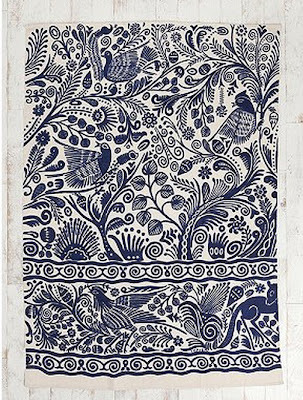 But I do love a good pattern :) Decisions, decisions! I think we should watch the Big Lebowski for some rug inspiration. Pyrus calleryana. Terrible terrible tree. Kurt sounds like a grumpy old man... what's wrong with those trees? I'm with you Mel - they are a nice sign of spring :) I like the new blog design (obviously, it's been a while since i've actually clicked off of my reader). Side note: I don't think I'll ever get used to seeing thumbs on a cat.